Fun image! Great line. I like his expression, and the fact that he's talking on a landline. Don't see so much of that these days anymore. He's right, cookies make you fat! Speaking of telephones with hard lines... this is a common problem that comes up in cartooning and animation; we draw older technology because visually it's more interesting, warmer, and more humorous. Modern things are becoming colder in appearance, and lack the personality of vintage technology, so we as artists just naturally gravitate to the old stuff. I mean, what's more fun to draw, a modern black flat screen, or an old analog set with dials and rabbit ears? I rest my case, your honor. 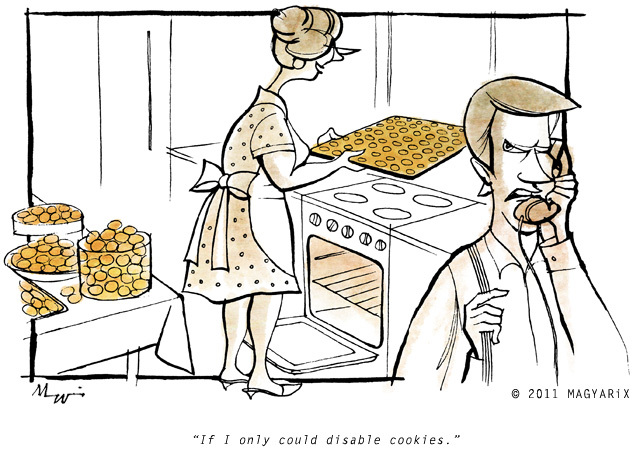 Haha..Great drawing!..To disable cookies in the good old days before the computer..he would of course had an old phone!! Great work! I love your style. Unique and cheeky. Congrats on being a favorite - love the feel of this & great play on words!